Two related species, A. minus and A. tomentosum are also sometimes used for medicinal purposes. Common Names: Burdock, greater burdock, great thistle, beggar’s button’s, Grosse Klette (German), niu bang zi (Chinese), gobo (Japanese), woowong (Korean). Distribution and Habitat: Burdock is native to Europe and Asia and has now spread worldwide in temperate zones. It is used in traditional Chinese, Korean, and European herbalism has developed independently in these different cultures. It was well-known to common people in Britain. The 17th-century physician Nicholas Culpeper described several uses of burdock, including treating ulcers, sores, and even dog bites! 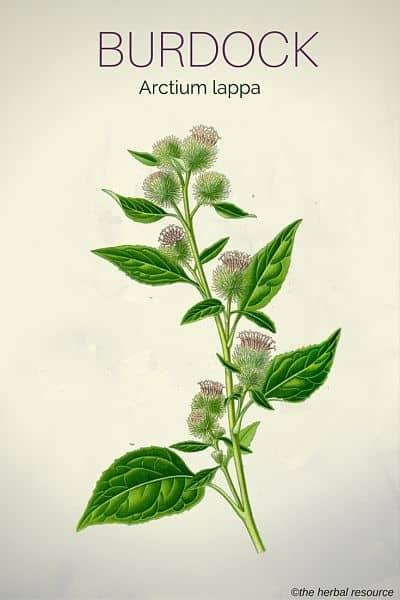 It is thought that the customary use of burdock by native peoples of Eastern North America may have actually been initiated by the early settlers from Europe, who brought the herb with them. Burdock naturalizes easily in new environments and becomes a weed in roadside ditches. Description: Burdock is a biennial herbaceous plant that grows as tall as 150 cm (5 feet). The large leaves are spade-shaped. The flowers resemble thistle flowers and come out of the top of the burrs, which attach themselves easily onto any passerby. Plant Parts Used: It is the dried root of burdock that has been mostly used as an herbal remedy in Chinese and European herbal practice; however, the Korean herbalists have long used the seeds of the plant. In Japan burdock is called “gobo” and is grown as a vegetable; the freshly dug up roots are served as a stew, fried dish or salad. Whether for food or medicine, the root must be harvested by the end of the first year, after which it withers. Chemical analysis of burdock revealed that the seeds actually have medicinal compounds quite different from those in the roots and in recent years more attention has been given to isolating the active compounds in the burdock seeds and testing these for their potential to fight viral infection and cancer. 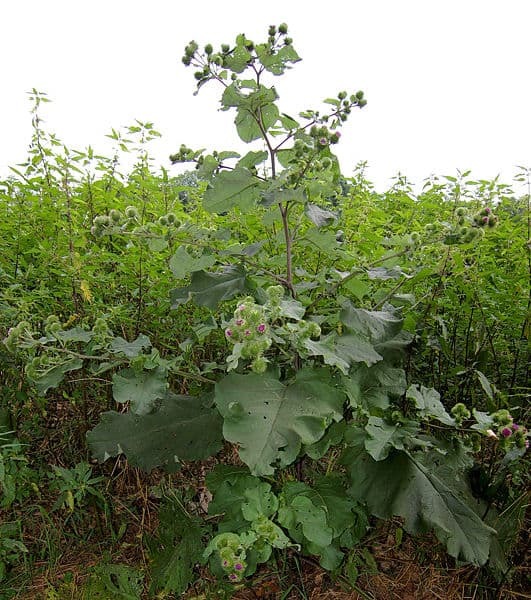 In traditional herbal medicine, burdock, much like its close relative milk thistle, has long been used for “blood purification”. Today this is called “detoxification”. Conventional medicine has viewed much of the general claims of detoxification as false or at least overly broad and unsupported by facts. However, an objective assessment of the value of detoxifying herbs such as burdock can only be made by breaking down the broad claim of detoxification into the different physiological processes and looking at each of these. Diuretics, which stimulate the production of urine and thus elimination of various waste products, might help in resolving a number of urinary problems including yeast infections and kidney stones. It is the seed of burdock that has been used as a treatment to expel kidney stones, since at least the 1600s and possibly earlier in Chinese medicine. It may be because of this diuretic action that burdock was once prescribed for gout; however, there is not much evidence that it is effective in eliminating gout. So, although burdock is a diuretic, it remains to be seen whether this action alone is enough to cure specific complaints such as edema or urinary tract infections or obstructions. Another form of detox is chelation therapy, which is the binding of molecules to harmful metals such as mercury, lead, and arsenic. Burdock is a frequently listed as a chelating agent in naturopathic medicine; however, there is as yet very little or no chemical evidence of this. Detoxification can also mean enzymatic activity, which is the naturally occurring chemical process by which the body’s metabolic products are broken down, through the interaction of enzymes with various waste proteins. This does not seem to be a key mode of action in the case of burdock. However, detoxification can also mean the removal of harmful microbes, and in this case, at least there is plenty of scientific evidence that burdock is indeed an effective herbal remedy. Burdock root has mild antibiotic action and is used to treat skin infections such as acne, eczema, psoriasis, and seborrhea. Likewise, the antibiotic action of burdock is used in Chinese medicine to treat sore throats and colds. The healthy effect that burdock has on the skin has been shown in laboratory and clinical studies and may be due to more than its mild antiseptic property. Researchers have confirmed that extracts from the burdock seeds promote blood circulation to the skin and speeds metabolism of the skin cells, thus quickening healing of injured skin and even lessening the appearance of wrinkles. It was the burdock seed, in particular, that had this effect. An extract from burdock seeds has been shown to be an effective treatment of high blood pressure by acting on the smooth muscle of arteries. The precise identity of the chemical or chemicals (likely lignans) that are responsible for this effect is not known; however, the extract from the seeds is not much different from what has been used in traditional Korean medicine. Read more on herbs for high blood pressure. Burdock has been used in Asia and elsewhere in the world for treating stomach and intestinal problems. Although burdock is not native to South America it has long been used in Brazilian traditional medicine to treat chronic stomach upset and ulcers. 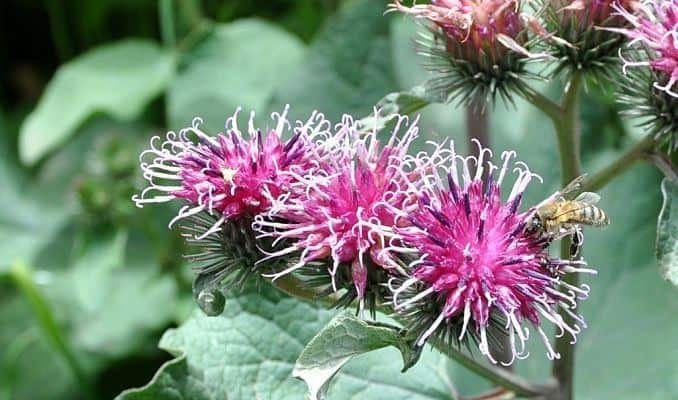 Burdock root extracts were found effective in treating experimentally induced colitis and gastric ulcers in laboratory animals, thus confirming the value of this herbal remedy. It is the anti-inflammatory compounds in burdock that are effective in treating these problems. Lignans are free-radical scavengers, i.e. anti-oxidants. The seeds of burdock contain as many as twelve kinds of lignans, the most frequently studied being arctigenin, arctiin, and essiac. These naturally occurring chemicals have been investigated for their antioxidant activity and as possible cancer drugs. They are found in the seeds in high concentration but not in the roots. A thorough chemical analysis of burdock revealed that the seeds contain a large number of both lignans and caffeoylquinic acids in high concentrations. In contrast, the root contains other bioactive compounds but only trace amounts of lignans. Medical researchers were slow to turn their attention to burdock but this has changed in recent years. There is now a slew of exciting discoveries as the anti-inflammatory agents, especially the lignans, are better isolated and manipulated in the lab. In particular, arctigenin, which was only recently fully described, is now the target of many experiments to assess its potential as an antiviral and anti-cancer drug. Artigenin was found to selectively kill cancer cells when the artigenin was combined with 2-deoxyglucose, which acts as the ‘bait’, causing the tumor cells to take up both the sugar and the anti-inflammatory agent. Another team of researchers in Japan discovered that the arctigenin isolated from burdock is tumour-specific, i.e., it targets only certain kinds of cancer cells but not normal cells. The cancer cell lines that artigenin acts against are lung, liver, and stomach cancers. Arctigenin may also slow memory loss by acting as an acetylcholinesterase inhibitor; this information comes from experiments on rodents and not humans. Scientists have now begun to isolate different classes of bioactive chemicals from the leaves of burdock, although there is little indication yet of the medical significance of these. Because it is rather potent, burdock is usually mixed with other herbs. For treatment of minor skin afflictions such as acne, a decoction of 2 tsp dried burdock root and 5 tsp dandelion root is mixed with water to be ingested once a day. A poultice can also be made with the fresh leaves. The seeds contain different – and often powerful – bio-active chemicals than do the roots and leaves. For this reason, a medical professional should be consulted before using herbal remedies made from the seeds. The European Medicines Agency has yet to complete their public recommendations on the use of Arctium lappa. The U.S. Food and Drug Administration considers burdock root to be generally safe. One should not obtain burdock root that has been gathered by an untrained person. The roots closely resemble those of several poisonous plants and there is the possibility that these could be inadvertently mixed. Burdock is in the same family as ragweed and other allergy-causing plants. Dermatitis can be a side effect for those persons prone to allergies. Burdock can also slow blood clotting. Those who are already taking blood thinning medications should not take it without their doctor’s approval. The same is true for persons taking diuretics, whether synthetic or natural. Culpeper, Nicholas. The Complete Herbal, London, 1653. Chan, Y. S., L. N. Cheng, J. H. Wu, et al. A review of the pharmacological effects of Arctium lappa (burdock). Inflammopharmacology. 2011, 19(5): 245-254. Knott, A., K. Reuschlein, H. Mielke, et al. Natural Arctium lappa fruit extract improves the clinical signs of aging skin. J. Cosmet. Dermatol. 2008, 7(4): 281-289. Lee, Y. J., D. H. Choi, G. H. Cho, et al. Arctium lappa ameliorates endothelial dysfunction in rats fed with high fat/cholesterol diets. BMC Complementary and Alternative Medicine 2012, 12: 116.
de Almeida A. B., M. Sánchez-Hidalgo, and A. R. Martín. Anti-inflammatory intestinal activity of Arctium lappa L. (Asteraceae) in TNBS colitis model. Ethnopharmacol. 2013, 146(1): 300-310.
da Silva, L. M., A. Allemand, and D. A. Mendes. Ethanolic extract of roots from Arctium lappa L. accelerates the healing of acetic acid-induced gastric ulcer in rats: Involvement of the antioxidant system. Food Chem. Toxicol. 2013, 51: 179-187. Predes, F. S., A. Ruiz, J. E. Carvalho, et al. Antioxidative and in vitro antiproliferative activity of Arctium lappa root extracts. BMC Complementary and Alternative Medicine 2011, 11: 25. Tezuka Y., K. Yamamoto, S. Awale, et al. Anti-austeric activity of phenolic constituents of seeds of Arctium lappa. Nat. Prod. Commun. 2013, 8(4): 463-466. Gu, Y., C. Qi, X. Sun, et al. Arctigenin preferentially induces tumor cell death under glucose deprivation by inhibiting cellular energy metabolism. Biochem. Pharmacol. 2012, 84(4): 468-476. Susanti, S., H. Iwasaki, Y. Itokazu, et al. Tumor specific cytotoxicity of arctigenin isolated from herbal plant Arctium lappa L. J. Nat. Med. 2012, 66(4): 614-621. Lee, I. A., E. H. Joh, and D. H. Kim. Arctigenin isolated from the seeds of Arctium lappa ameliorates memory deficits in mice. Planta Med. 2011, 77(13): 1525-1527.